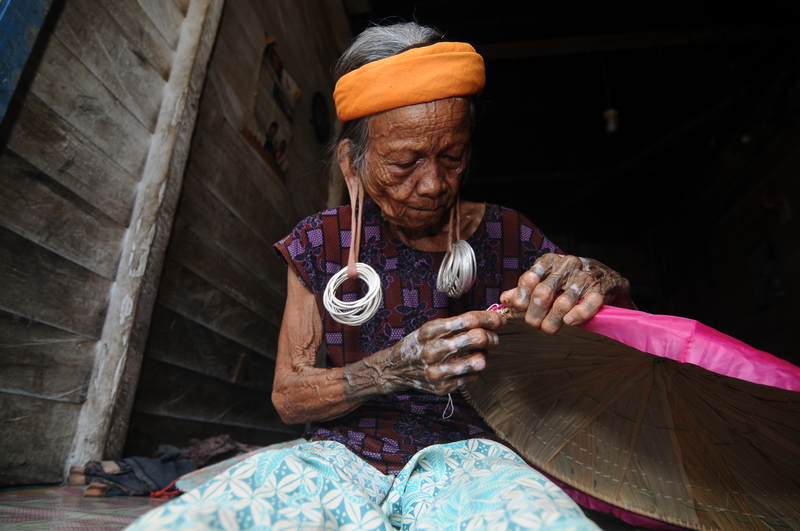 A culture for Dayak women includes a belief of beautifying herself. They do it with tattoos and elongating the ears. In Mahakam Ulu, older generations usually have elongated earlobe with silver or iron earrings dangling up to their shoulders. The Dayak people who live in the upstream area of the Mahakam River, East Kalimantan have rich traditions and cultures that are still inherent in their daily lives as a continuation of their ancestral traditions while living in this world. Starting from the way in managing their lands with its rituals because of the belief that there are spirits from Heaven that are always watching over them. Dayak Bahau people, especially the Bahau Long Gelaat Tribe in Long Tuyoq village, an area located on the deep inside the Heart of Borneo in East Kalimantan, most of the elders are still having the long-eared tradition, which in the local language is called telingaan aruuk, a very unique tradition from their ancestors. 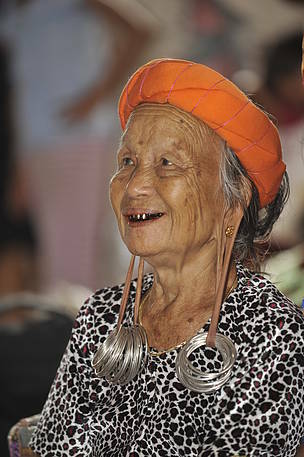 In the past, a Dayak woman with long earlobes will be considered as the most beautiful woman by the people in the village. Earlobe piercing process itself began since childhood. When a baby girl turns to ± 4 years old, her ears will be pierced (locally known as subang) to make her familiar with the piercing so that the hisang – earrings for elongating the earlobes can be worn. The increasing age is followed by the increasing the number of hisang. When a woman is married, the total hisang could be about 20 pieces in each ear, depending on the social status in her community. The hisang itself is made of silver or bronze which is also adjusted to their social status. The longer it is, the more significant that person is to the tribe. There is also an assumption that the purpose of lengthening the ears is not to show the noble status, but a symbol of patience. If it is used every day, patience and the ability to withstand the suffering of the heavy hisang will be stronger. Even though they have long earlobes, it does not bother the Bahau Dayak women in their daily activities, whether it's farming, land-clearing, feeding livestock even making handicrafts. Are they in pain by wearing the heavy metal ballasts on their ears? No. The women are even proud of the culture they have. For them, long earlobes are an identity, a symbol of greatness, a sign of nobility and a symbol of beauty. Women's identity to be valued as a woman is seen from how long their ears are. Until now, although most of them are older generations (locally known as boo’doh - grandmother), they can be found in the village while weaving rattan or making the traditional handicraft called seraung – a hat made from pandan leaf. Unfortunately, they are the last generation of Dayak women with long earlobes. Those who were born in the 60s will no longer follow the tradition of lengthening ears because it’s considered outdated. The ancestral tradition is on the verge of extinction due to the modernization and globalization began to permeate the lives of the Dayaks. And it also impacts to the perception that to become a woman does not need to elongate the ears. Nowadays, in Long Tuyoq village, there are no more than 7 women with long earlobes and all of them are old generations. Although not all Dayak tribes have that kind of tradition, but when visiting the village in the upstream area in Mahakam River, we can still meet long-eared women from the Penihing Tribe, the Kayan Tribe, the Bahau Tribe and the Kenyah Tribe for the next few years. Times have changed, civilization has quickly changed. Documentation and recording of historical stories are very important. These tradition and culture need to be known by future generations. 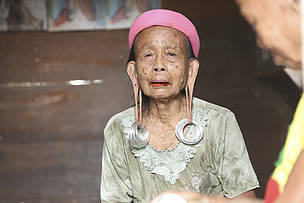 In Mahakam Ulu, older generations usually have elongated earlobe with silver or iron earrings dangling up to their shoulders. 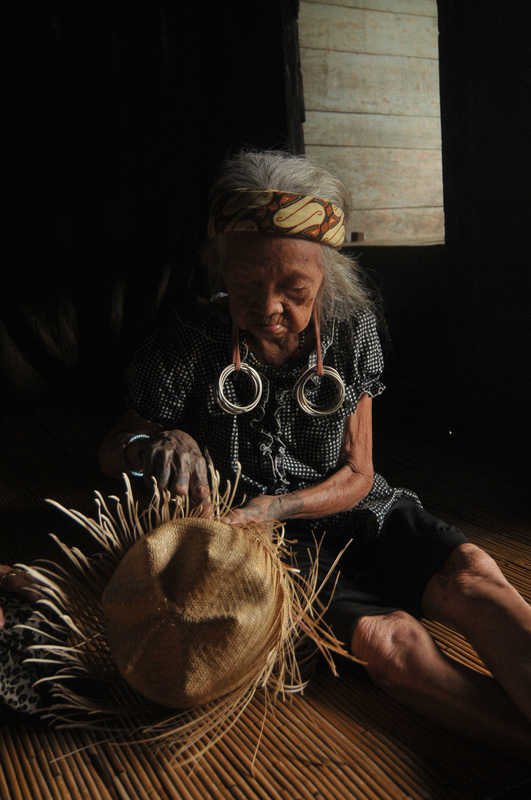 Until now, although most of them are older generations (locally known as boo’doh-grandmother), they can be found in the village while making the traditional handy craft called seraung – a hat made from pandan leaf or weaving rattan. In the past, a Dayak woman with long ears will be considered as a true woman and the most beautiful woman by the people in the village. There is also the assumption that the purpose of lengthening the ears is not to show the noble status, but a symbol of patience.